There is no treatment, behavioral or pharmacological, that will ensure that you will sleep well on a given night. 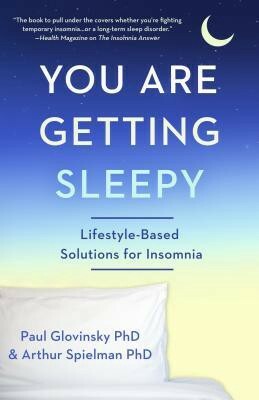 “You Are Getting Sleepy: Lifestyle-Based Solutions for Insomnia” is written by Paul Glovinsky and Arthur Spielman, experts in Sleep Therapy and co-authors of the book “The Insomnia Answer”. This book offers an individualized approach to getting better sleep, taking into account the particular challenges that stand in your way. In addition, the book also takes the approach that trying to sleep is counter-productive. Instead, it recommends we get to a state where we are sleepy, which will then lead to us falling asleep. “You are Getting Sleepy’ is a concise book which is to the point. There are seven chapters overall. The next three treatments are indirect — Progressive Relaxation, Autogenic Training and Mindfulness Meditation. “You are Getting Sleepy” is a book that has a razor sharp focus on addressing the sleep problem. So, the content is rich and informative. The other aspect of the book which stood out for me was its structure. Instead of making the reader trudge through pages of irrelevant content, the specific chapters let the reader get to their problem right off the bat. There is nothing in this book that I did not like specifically. But, I would like to read a few more books on this subject to understand where the pseudoscience stops and science starts. “You are Getting Sleepy” is the first book on sleep and insomnia that I have read. I found it informative and useful. Personally, the information in this book is not going to solve my sleep issues since I sleep apnea, but readers with anxiety issues, hyper-arousal problems and depression will definitely find it helpful. I recommend this book for fellow insomniacs.